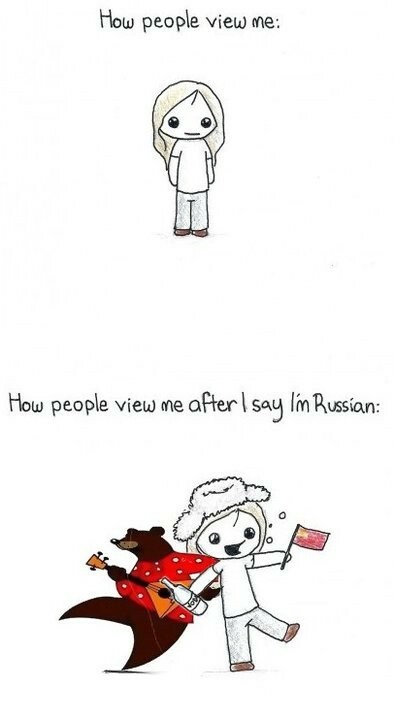 The very first article I translated from English into Russian was about stereotypes in different countries. It was really amusing and I still can quote some parts of it. Barcelona is a perfect place to get rid of all the stereotypes that are there in your cultural luggage. I almost feel cheated by my Italian, French, British, Spanish, etc. friends, who are nothing like what I learned before! The fun part comes when you realize that every country and culture has its own stereotypes about the others. We just see the world differently. For example, would you believe that the phrase ‘to make a French exit’ is literally translated into French and Russian languages as ‘to leave like an English person’? Before I came to Spain, I heard a lot of stories about Spaniards who like to drink and party a lot. But you know what is currently the #1 hit among the partying population in Salou, Lloret de Mar or Torrevieja at 5 o’clock in the morning? It’s ‘God save the queen’ - and the singers are definitely not locals. No offence: as the picture demonstrates, I get that a lot, too! Last year, I went to salsa classes at the weekends. I was eager to meet a lot of ‘latino’ friends and practice my Spanish. Well, my first salsa partner was German, the next one a Swede. That sends a hint that not all people from Latin America dance salsa, or to put it another way – there are people who enjoy and dance salsa apart from Latin-Americans. Are there any fun stereotypes about your country?